28 March - 10 October. 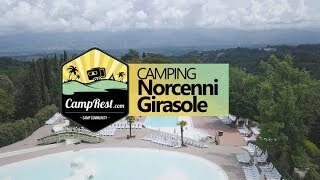 The Norcenni Girasole Club is a brilliant, busy and well run resort style site in a picturesque, secluded location with great views of Tuscan landscapes, 19 km. south of Florence. 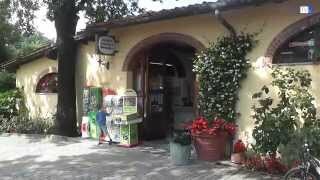 Owned by the dynamic Cardini-Vannucchi family, great care has been taken in its development and the buildings and infrastructure are most attractive and in sympathy with the area. Of the 850 pitches, there are 148 roomy pitches for touring units, 107 with 10A electricity and 41 fully serviced with 16A electricity. Most are shaded by well tended trees. A considerable number of mobile homes and other types of accommodation are available to rent. Families will enjoy this site as there really is something for everyone. Everything is available and to hand and a road train service operates between its two sections. You will only need to leave to visit and enjoy the many local attractions. In the huge, resort style pool complex there is a superb choice, with pools for children of all ages plus free water flumes. There are plenty of activities for youngsters, including a new tree walk and zip wire. An extensive entertainment programme is available weekly, plus courses in Tuscan cooking, wine tasting and the Italian language. Four different restaurants, each with their own terrace, provide an excellent choice of food and ambience, from the cosmopolitan San Andrea, to the Il Vecchio serving a choice of traditional Tuscan fare. Sanitary facilities are excellent with British WCs. Some hot water is available. Family bathrooms to rent (book in advance). Facilities for disabled visitors. Laundry facilities. Motorhome services. Supermarkets and gift shops. Bars and three restaurants. Pizzerias. Gelaterias. Two resort style pool complexes with soft slides. Pool bar/snacks. Small health complex with saunas, jacuzzi, steam bath, fitness centre and massage at extra cost. Tree walk. Zip wire. Games area. Soundproofed disco. Two floodlit tennis courts. Riding. Minigolf. Bicycle hire. Scooter hire. WiFi (charged but free for gold pitches). ATM. Extensive entertainment programme. Excursions. Information point. Customer service desk. From Florence take Rome Al/E35 autostrada and take lncisa exit. Turn south on route 69 towards Arezzo. In Figline turn right for Greve and watch for Girasole signs. Site is 4 km. up a twisting, climbing road.